High performance part time - is it possible? A misalignment exists between the perceptions held about part-time work and today’s reality. Part-time work proves beneficial for both employees and employers, with gains to be realised in terms of productivity, commitment and employee satisfaction. Flexible work arrangements have been embraced by leading organisations around the globe and are enshrined in law in Australia. Digital platforms like Freelancer.com, Expert360 and Uber bring extreme flexibility with the ability to work when and where you choose. Yet one form of flexibility – part-time work – still carries stigma. There is a common misconception that part-time work arrangements are a concession given to employees (in particular women) with competing commitments. By many, it is viewed as a trade-off between the employee’s needs and those of the company. Nous experience and research shows that the opposite is true. There is much to be gained by engaging employees on a part-time basis. Beyond attraction and retention, evidence shows that part-time employees are more productive, more committed and have less unplanned absenteeism than their full-time counterparts. Part-time work can also give employers access to specialist expertise that they couldn’t justify – or afford – employing full time. Nous realised the benefits of part-time work more than a decade ago. Over 30 Nousers work part-time and an additional 14 work less hours than part-time, as Senior Advisers. While in-office time is still very valuable, all Nousers are trusted to work from any location, at the times that suit them, as long as they meet their client and internal commitments. We recently ran a survey across all part-time staff and noted some surprising results. 41% of Nous part-timers are part-time to develop and improve themselves through study, compared with only 24% that work part-time to balance care responsibilities. The rest are pursuing other extra-curricular activities (24%), managing medical-related issues (7%) or managing career transitions (4%). In addition, those working part-time for care reasons are more likely to work excessive hours (pro rata) than those working part-time to study. Half of those working part-time were attracted to Nous because of its genuine flexibility. Furthermore, the ability to work part-time is one of the reasons most part-timers choose to stay. Part-timers were also more likely to work excessive hours (pro-rata) than their full-time colleagues, and perhaps most notably, some of our part-timers are among our highest performing consultants. Employers are required to make some changes to successfully accommodate part-time work, as are their employees. Nous’ experience and research has uncovered a range of enablers and derailers to inform such practice. We know that human productivity is by no means consistent. 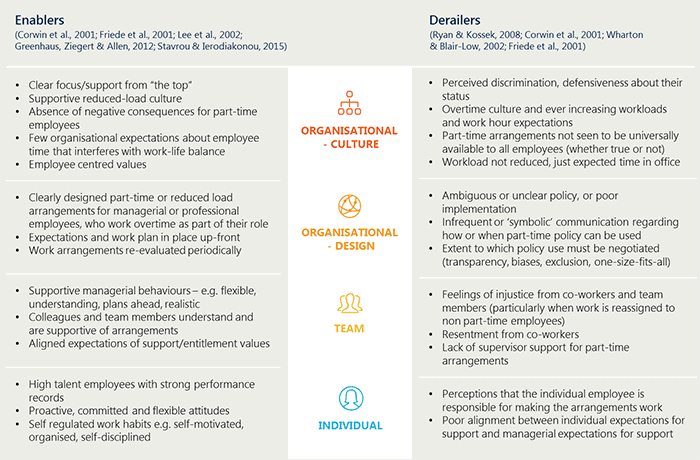 It is influenced by a number of factors that organisations have the power to shape. We also know that employees increasingly crave collaboration and diversity in the workplace, and that providing an environment for this is becoming a necessity for businesses. If you think it’s time to consider your flexible arrangements get in touch to find out how Nous can help you review your workforce strategy to drive high performance. Nous has been recognised as a Great Place to Work in Australia and Asia.